Aztec was established at the end of 1993. After a year and a half Aztec has released their first demo that was recorded in live session and called "Place of evil born" all the copies sold out. 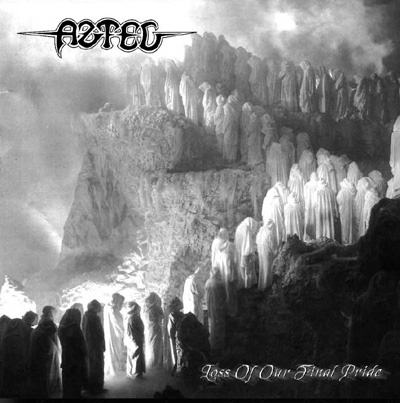 Aztec has finished recording their second demo called "Loss of our final pride" which includes 10 dangerous tracks of melodic black/death metal. the demo was recorded in 16 channels at "Muskat studio" and produced by Zeev tananboim from "Salem". The album is distributed by "Raven Music" all around the world. can find on the Aztec website. Now you also can find what's new in metal, pictures, new albums, stories. ...What's the meaning of "The control is in your own hand ?" Well it's kind a easy to explain. Think of us as your privates webmasters...you have an idea for new subject, send your idea details and we'll do all the hard work, very simply, no ? you can be a reporter, to explore new albums, you can be famous (if you have a band) and many more. (we are advertiser idea that connected to music ONLY). Briefly...the surfers are builds this site. Goodluck.